These emails are sent to your consignors as a progress notification of each item you list and sell for them. You can choose to enable that specific email notification or disable it. For instance, if you do not want to email your consignor when the item sells, you can uncheck the Auction Sold tab’s checkbox. Below is a list of the tags that can be used within the emails. Please note that certain tags will not work inside of certain notifications, and will only show up as text. 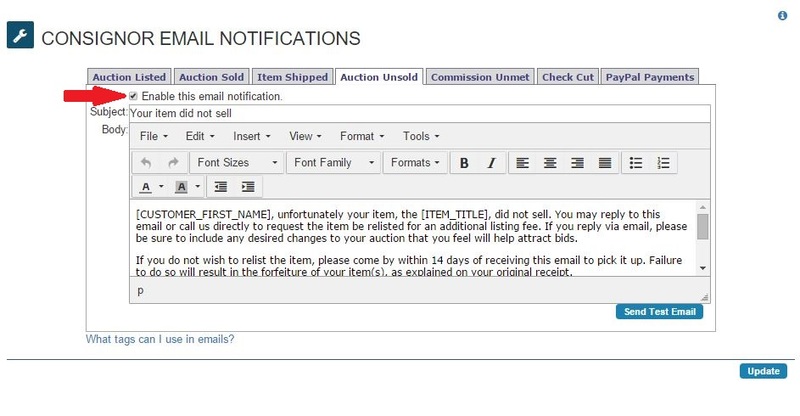 For instance [AUCTION_SOLD_PRICE] will not pull up any information if used with the ‘Auction Unsold’ notification.